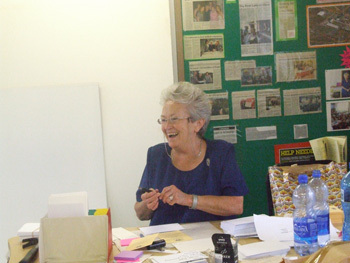 Sister Ethel Normoyle is the Founder and Director of the Care Centre with a staff of a Manager and small team working in the various operating units. On a daily basis there is a large group of volunteers from the local community who assist with various daily tasks and projects at the Centre. The Missionvale Care Centre Trust, made up of volunteer Trustees from the Nelson Mandela Metropole business community, provides financial support and governance for the Care Centre. The Trust is registered in terms of South African Law as a Public Benefit Organization and as a Non Profit Organization.